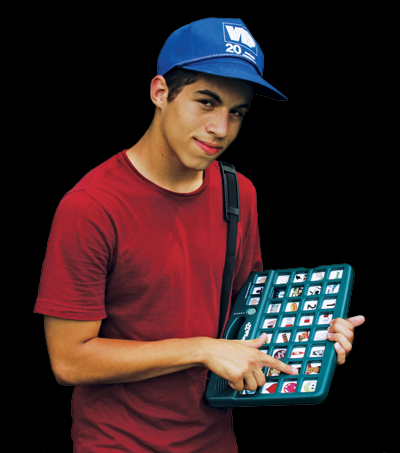 This easy-to-use, 160 message, AAC device supports those with limited to no speech throughout their daily activities. 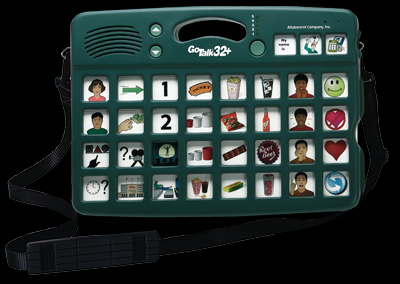 Functions like the GoTalk 4+, GoTalk 9+, and GoTalk 20+ but with 32 messages plus three core vocabulary keys. The GoTalk 32+ has five levels, giving this talker a 163 message capacity. The message keys record for 10 seconds and the core vocabulary keys record for 17 seconds. Now includes a free shoulder strap. Size: 14¼ x 10 x 1⅝ inches. Weight: 2 pounds, 1 oz. Total recording time: 19½ minutes. Includes two AA batteries, printed User's Guide and 2-year warranty.